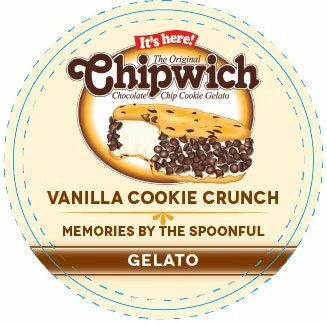 Second Scoop Frozen News: CHIPWICH® Goes Italian - Delizioso! CHIPWICH® Goes Italian - Delizioso! Born in NYC the iconic ice cream brand CHIPWICH has launched a Kosher CHIPWICH Gelato. through one of NY's largest Ice Cream Distributors - Marina's Ice Cream. The new brand, CHIPWICH GELATO™ was developed by the Award Winning Master Gelatiere, Mauro Petrini and his dedicated team at Gelato Petrini located in Delray Beach, Fl. www.gelatopetrini.com. CHIPWICH GELATO ™ will be available in July throughout New York City and is packaged in convenient pint size containers. Chipwich Gelato ™ pints are Kosher, filled with delicious vanilla gelato, crunchy cookie crumbs and mouth-watering chocolate chips. The famous ice cream brand CHIPWICH® has been voted the # 6 most iconic dessert brand in America by TIME Magazine and is loved by millions of consumers. Stop by your nearest store and ask them to get you the new CHIPWICH GELATO ™ today!